Here you can see those of my works which are in public spaces. Click to enlarge. 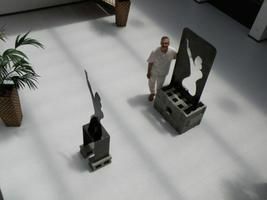 One of Ricard Mira’s main characteristics as a sculptor is his making of sculpture-sets for public monuments, which are located in several municipalities of Spain, especially in the Catalan area of Baix Vallès, such as in the city of Mollet del Vallès and in the villages of Sant Fost de Campsentelles and Martorelles. This is a sculpture made of iron and stainless steel and located in the Church of Santa Rosa at Mollet del Vallès (Barcelona). The 3.70 m high cross is installed to the left of the main altar, on a base made of iron and stones representing the hill of Calvary. The model for the 1.80 meters high figure of Jesus was Albert Mira, the artist’s nephew. 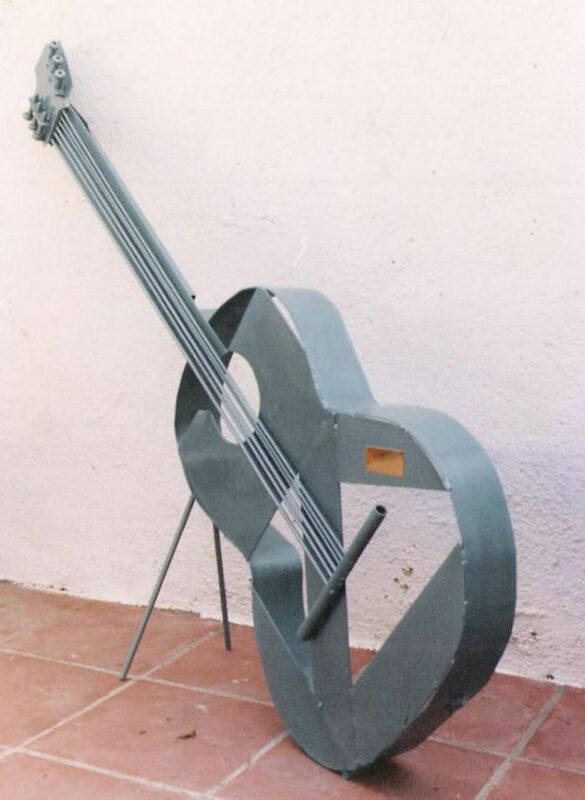 Sculptor Lluís Pérez Quiroga (Lupequi) helped to create this sculpture. 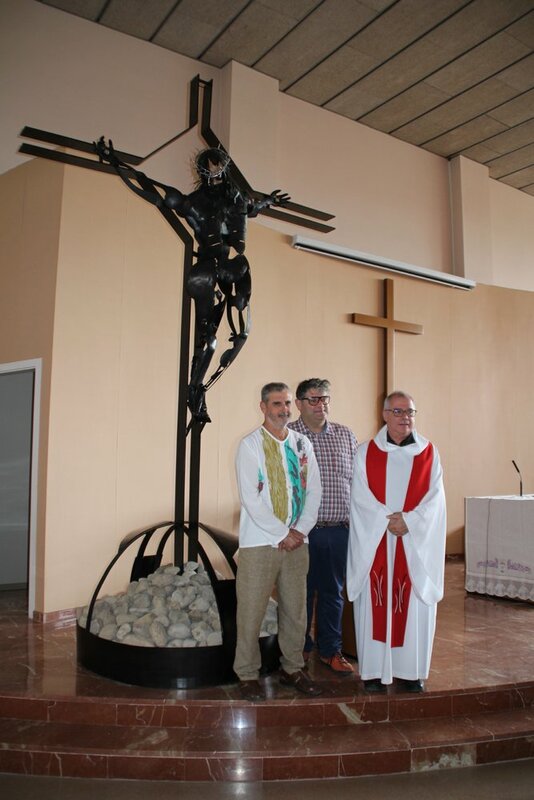 It was inaugurated on 3 September 2017, on the occasion of Monsignor Miquel Planas’ moving to Terrassa. It’s a monument to Lluís Companys completely made of iron, weighing 2,600 kg. It symbolizes Catalonia, the country that the President of the Government of Catalonia was shot for. Within the map of Catalonia there is a relief of his face, and also the places where he was born and shot. His ideological principles are listed on a plaque. 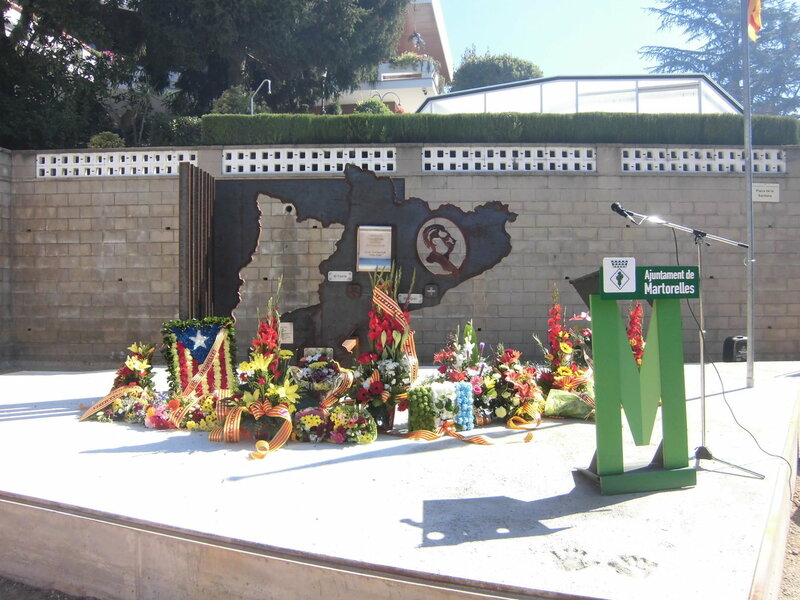 The monument is located in Plaça de la Sardana at Martorelles (Barcelona), and is intended to be a meeting place and to serve as a stage for the speeches and the floral offering traditionally held on the National Day of Catalonia (11 September). Sculptor Lluís Pérez Quiroga (Lupequi) helped to create this sculpture. It was inaugurated on 12 May 2017. 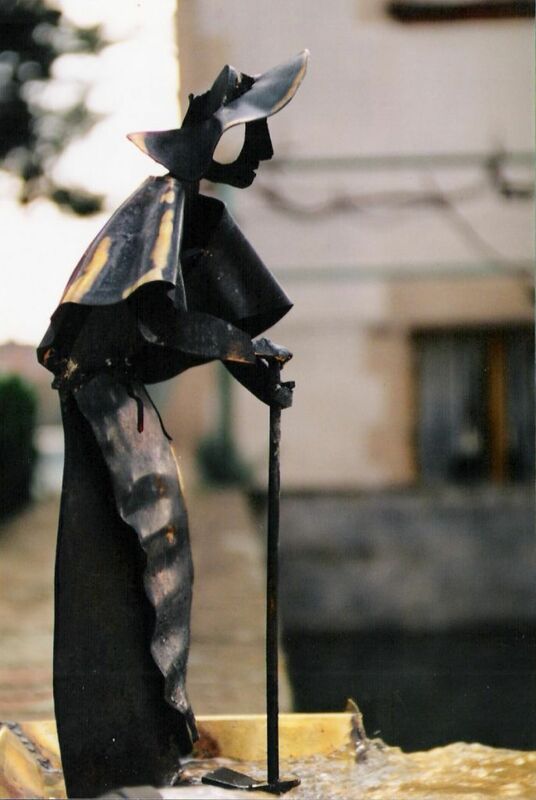 This work is made of iron scrap, and sits on an equally iron pedestal. The wheel measures 125 cm in diameter x 200 cm in height x 72 cm in depth. It symbolizes learning and acquisition of intellectual maturity. It is located in the Alba del Vallès high school, at Sant Fost de Campsentelles (Barcelona). It was inaugurated in September 2014. 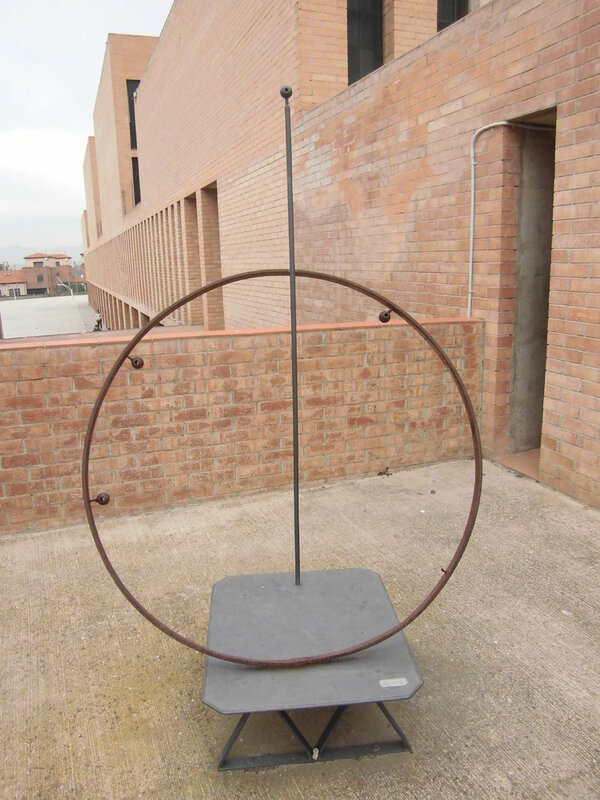 This is a work made from recycled iron and brass, with measurements of 130 cm x 46 cm x 153 cm, representing the radio waves. It is in the studios of Ràdio Mollet del Vallès, at the Centre de Serveis El Lledoner, at Mollet del Vallès (Barcelona), and was inaugurated on February 4, 2011, to mark the 30th anniversary of Ràdio Mollet del Vallès. It is a sculpture-set consisting of two works arranged so that one is seen inside the other. The all-iron, asphalt-finished, oxidized work measures 280 cm x 285 cm x 100 cm and 187 cm x 86 cm x 80 cm. It presided over the ceremony marking the beginning of the celebration for the first Nit de la Cultura (Night of Culture) at L’Ateneu of Sant Fost de Campsentelles, on April 9, 2011, when the prizes were awarded L’Ateneu biblioteca, L’Ateneu participació and L’Ateneu promoció. The winners received a model of the sculpture. 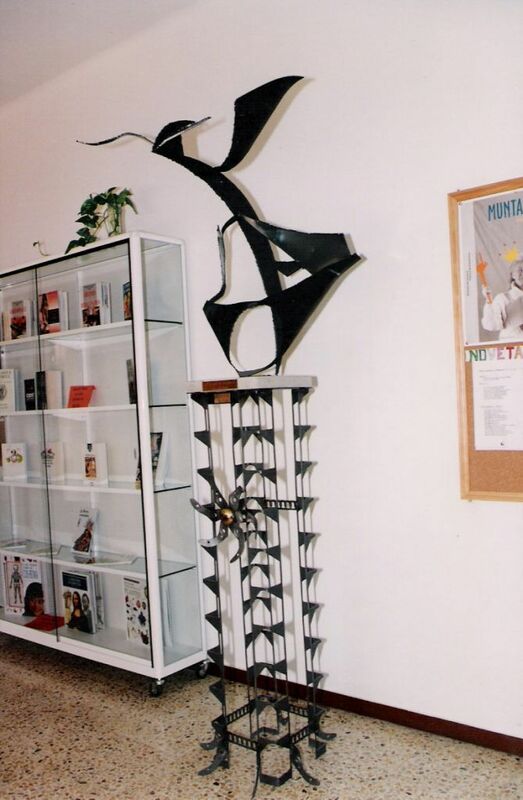 The work is in the lobby of the Auditorium at L’Ateneu of Sant Fost de Campsentelles (Barcelona). This sculpture is made from a thick iron plate, with an asphalt finish and a measurement of 133 cm x 55 cm x 40 cm, its title referring to the diminutive of the model’s name, Hortensia. Located in the lobby of Centre Cívic Joana Barcala in Mollet del Vallès (Barcelona), it was inaugurated in 2010, during the celebration of International Women’s Day. It sits on a pedestal made from scrap iron. This asphalt-finished work measures 110 cm x 60 cm x 50 cm, having the silhouettes of a man and a woman in couple cut in the iron plate. It presides over the Centro Cultural El Socós at Jérica (Castelló). It was inaugurated in 2008. 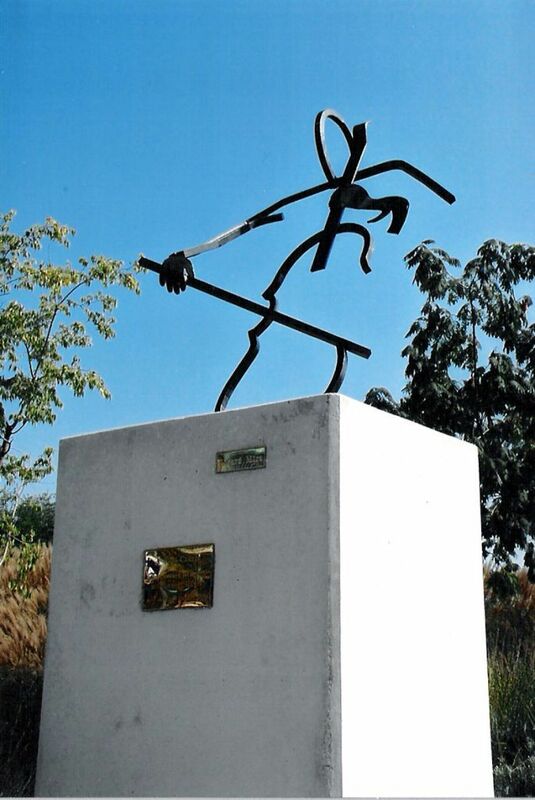 It is a sculpture made of 30 x 30 mm solid square iron bar, cold-forged and welded, primer-painted and finished with black paint, of size 400 cm x 100 cm x 130 cm. It represents Pau Casals’ (also known as Pablo Casals) silhouette playing the cello. 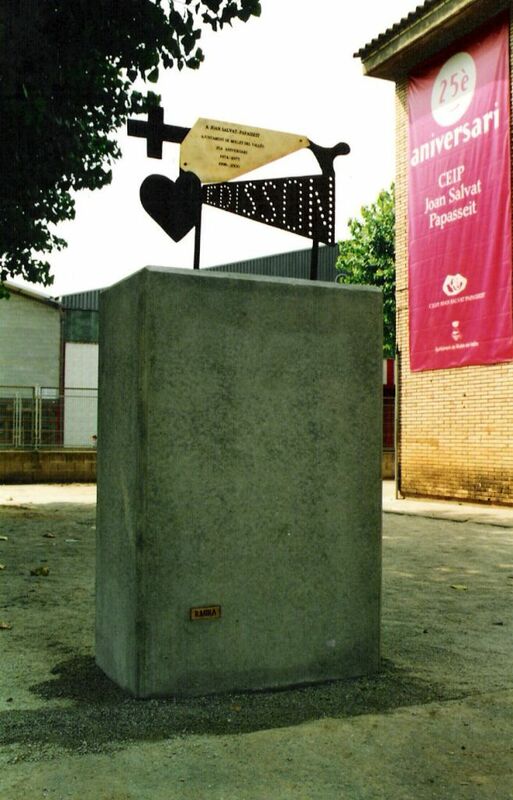 It is on a concrete pedestal at Pau Casals Park in Mollet del Vallès (Barcelona). It was inaugurated in October 2005, during the 24th Trobada de Bandes de Catalunya, which was attended by 30 music bands of Catalonia with a total of nearly 500 musicians. ▶ Details on the website of the city of Mollet del Vallès. 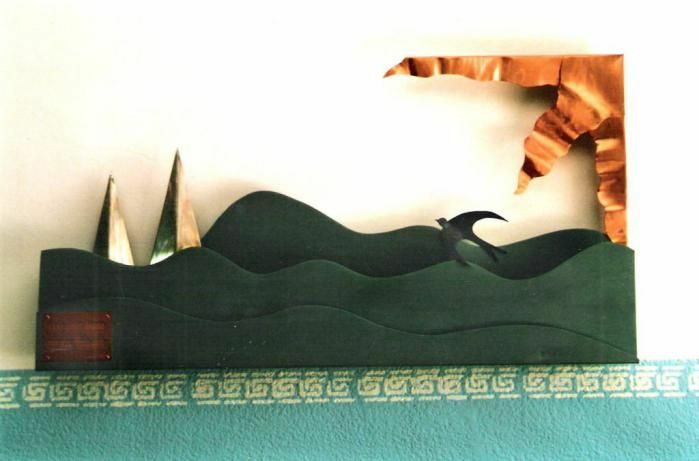 A work made of different metals (stainless steel, copper, iron and brass), 160 cm x 70 cm x 20 cm in size, where the following elements appear: two pyramids representing the school; the swallow that represents the parents’ association (which has a swallow as its logo); mountains, those in Martorelles, and the sun, which rises for everyone, representing this is a public school. 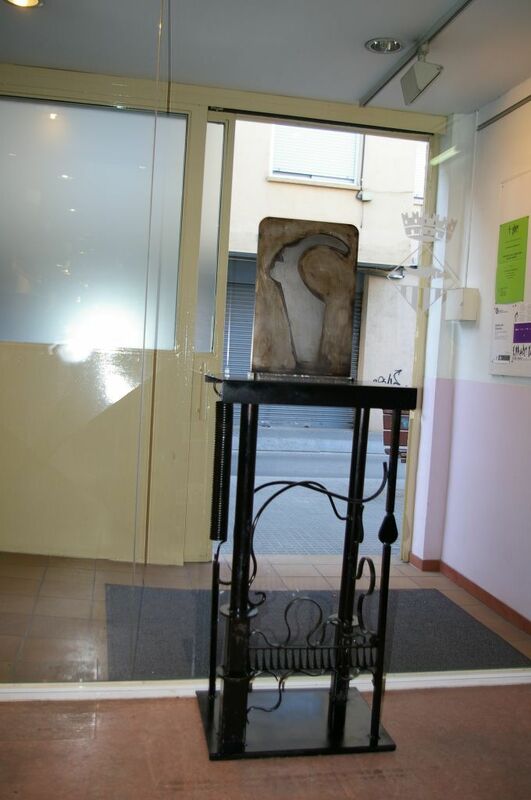 This work is located in the lobby of the Simeó Rabasa school in Martorelles (Barcelona). It was inaugurated in 2000 to mark the 25th anniversary of the school. 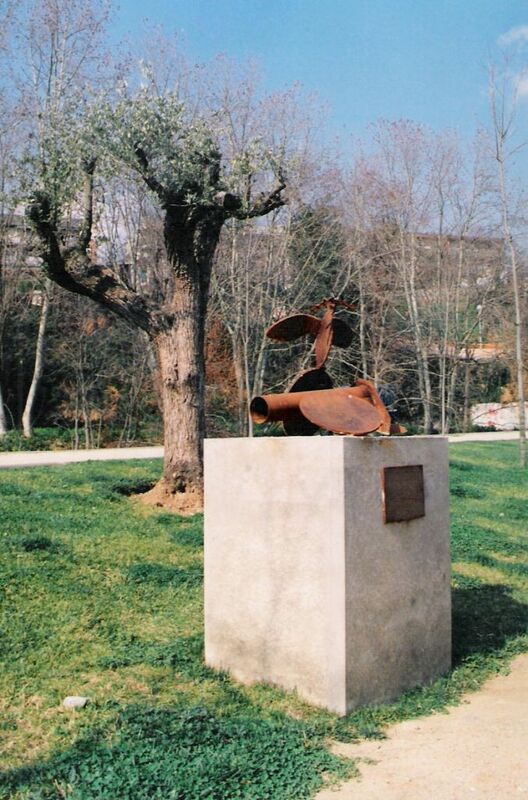 This is a work made of corten steel and brass on a concrete pedestal, with measures 200 cm x 100 cm x 60 cm, representing a visual poem by Catalan poet Joan Salvat-Papasseit that pays homage to Thomas Edison for inventing the light bulb. 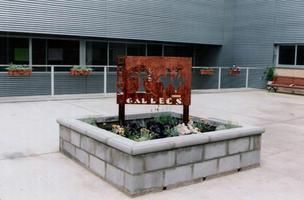 It is located in the schoolyard of the Joan Salvat-Papasseit school at Mollet del Vallès (Barcelona), and was inaugurated in 2000 to mark the 25th anniversary of this school. A work made of plasma-cut corten steel, 140 cm x 140 cm x 10 cm in size. 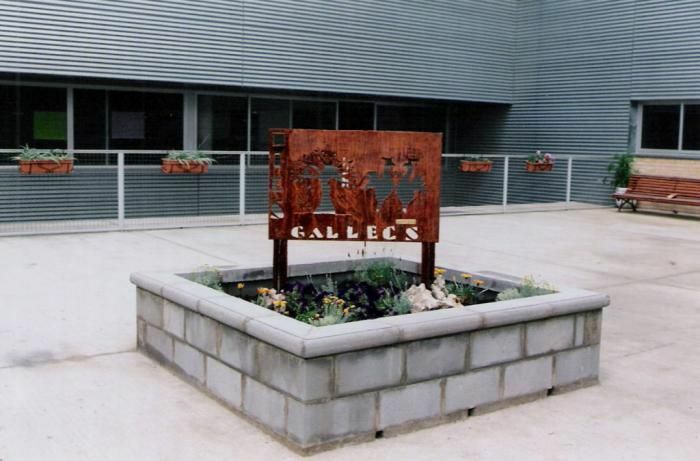 Located in the schoolyard of the Gallecs high school at Mollet del Vallès (Barcelona), it was inaugurated in 1998. It is a trencadís-style mosaic on a 450 cm x 200 cm wall reproducing the plums that were there before the school was built. 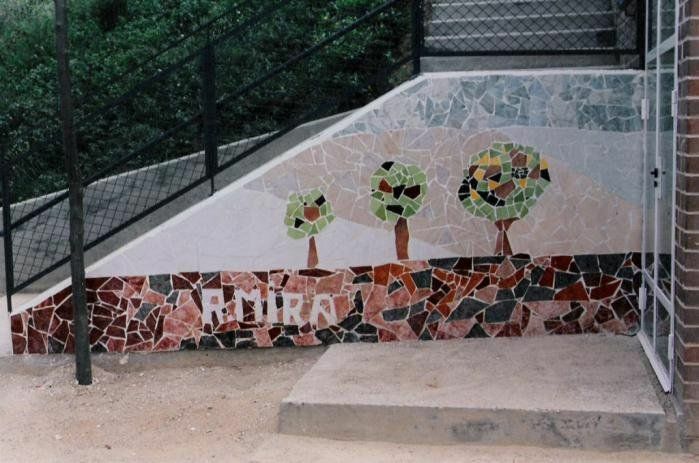 Located on a wall in the schoolyard of Les Pruneres school at Martorelles (Barcelona), it was inaugurated in 1998. This sculpture, made of iron and finished with green hammered-finish paint, measures 170 cm x 80 cm x 20 cm. It is located in the Escola Municipal de Música at Mollet del Vallès (Barcelona), in the building of Can Mulà, and was inaugurated in 1996 during the celebration for the 5th anniversary of the Escola Municipal de Música de Mollet del Vallès. A work made of corten steel on a concrete pedestal, 150 cm x 100 cm x 60 cm in size. It represents a dove with an olive branch on a destroyed cannon, symbolizing peace winning over war. It is located in Can Sunyer Park at Martorelles (Barcelona), and was inaugurated in 1996 to commemorate the peace in Bosnia. 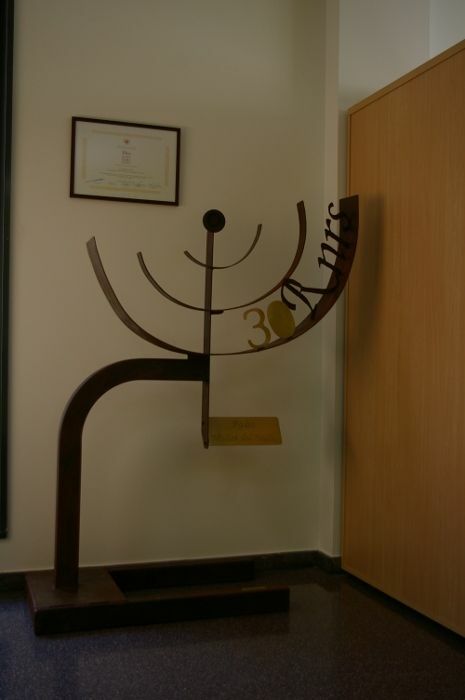 Made of cut, machined and welded brass, 60 cm x 40 cm x 40 cm in size. It represents a woman watering a field. It was located in the pond of the masia of Carrancà at Martorelles (Barcelona) and was inaugurated in 1996. 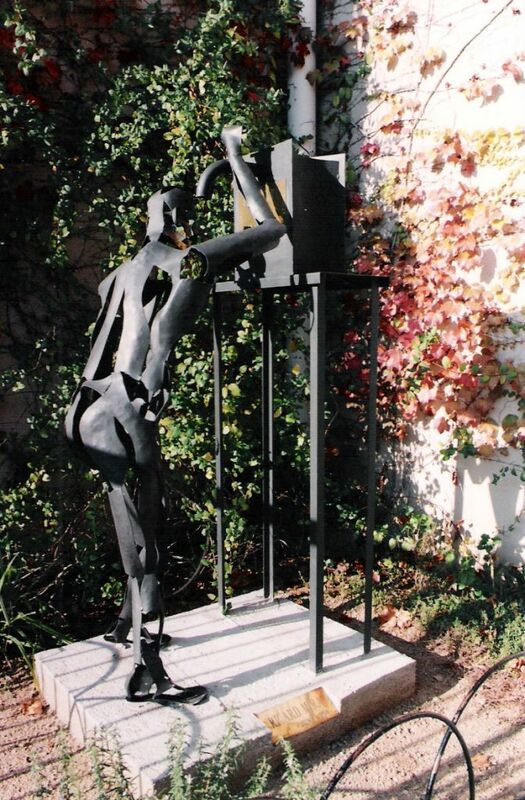 This is a sculpture made of cut, machined, welded, primer-painted and black-paint-finished iron, 200 cm x 60 cm x 100 cm in size and representing a life-sized child who is drinking from a fountain flowing from a book, symbolizing education at school. It is located outside the entrance to the Simeó Rabasa school at Martorelles (Barcelona). It was inaugurated in 1996. 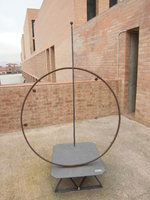 It is a work made of iron, welding pieces of scrap metal with no machining involved, placed on a pedestal made from the waste of die-punching out of the metalworking industry at Martorelles, with measures 200 cm x 80 cm x 65 cm and containing a dedication that says “To those who love culture”. It was located in the Biblioteca Municipal Montserrat Roig at Martorelles (Barcelona), and was inaugurated in 1995. Copyright © 2010-2017 Ricard Mira. This website is licensed under a Creative Commons Attribution-NoDerivs 3.0 Spain license. Last modified on 2017-01-14 using webgen.